Subspecies: Eastern Timber Wolf, Mackenzie Valley Wolf, etc. Wraen bears a striking resemblance with her mother Osprey, even if some aspects of her looks (such as colours) are a little different. Apple green eyes. Wraen is similarly colored to the grey-mantled wren...a popular songbird of the Northern Americas. Her coat is a dark grey (mottled with hints of brown) on her top that brightens into silvery white on her belly and legs. She has inherited her maternal grandmother's apple green eyes, however her expressions and mannerisms are that of Osprey's. 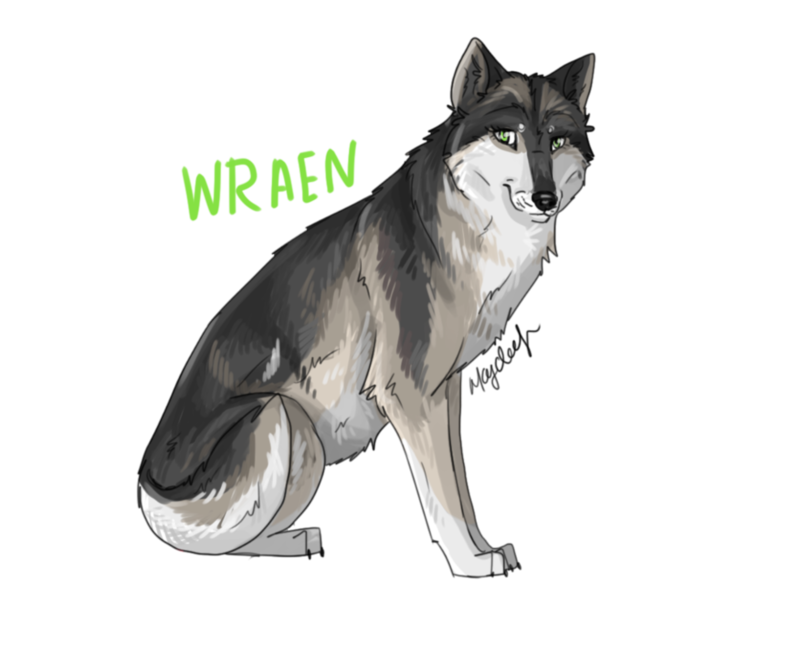 Wraen was born in the midst of famine, which has affected her growth and therefore she is lean and on the smaller side. Wraen carries the same good nature of Osprey and has inherited her passion for stories and story-telling. She is creative, comes up with her own tales and also has a collection of odd words in Common Tongue. She is whimsical and treats strangers as though they are dear friends. Though not a guardian by nature, she can also be quite aggressive and defensive to those, who she consider threats to her and her pack's safety. This can lead to unreasonable decisions. She has also a passionate nature and will defend her opinions and views strongly to the point that she can insult and hurt others by saying exactly, what she thinks in a spur of the moment. Recently, however, she is learning to restrain herself from this and be more considerate. She looks up to her brother, Terance, immensely and will self-sacrifice her own needs so that he may have everything he wants. However, over time she has had harder and harder time to understand and get along with him, leading to many conflicts between them and ending up with her leaving and setting on her own in autumn of 2018. Wraen had a strained relationship with her sister Sarah because of the latter's more dominant and introvert personality. She is the kind of girl that wants everyone to be happy and finds herself deeply troubled by those that don't like her or deem her unworthy. Wraen adores her younger sister Maia and gets along with her famously, due to the latter's open, cheerful and optimistic personality. Also because she is one of the few people with whom she feels free to be just the way she is and does not need to impress her in any way. Wraen makes friends easily and has many acquaintances in various corners of Teekon Wilds. Wraen was born to Osprey and Dante alongside her siblings Terance and Sarah. At the age of 4 months she and her family left Teekon wilds and until early spring of 2017 spent the better half of her life as a nomad, therefore she has seen quite a lot of the world. When Sarah and Terance left the pack, Wraen, while rather unhappy by the change, stayed behind to take care of the younger siblings, who had been born around that time, and immersed herself fully in the role of a caretaker. Few weeks later Sarah returned without Terance (after having been separated from him and getting lost), and with her came a young male, who she had met along the way. Wraen fell head over heels in love with him, but after being politely rejected and unable to cope with the feelings and the heartbreak, the girl decided to leave her family behind and with the hope that time and distance would help her heal, she went off in the world. She found Terance soon enough and joined him at Moonspear, however, after six months there she realized that despite Charon being her mother's good friend there were irreconcilable differences of opinion between her and his way of leading the pack. Therefore in February 2018 she left the pack together with her brother, Rannoch and Liffey and founded their own pack. Things ran really well in the beginning, however, she butted heads with Terance on more than one occasion about various subjects, the main being the number of puppies that were born and the inability of their territory to sustain them all. She tried to make best out of it, spending more time outside the pack, hunting, than actually being within and this led her to a burn-out in autumn and her decision not to join Sunspire wolves in their new home at Lost Creek Hollow. Ever since she has been a lone wolf on a soul-searching journey, traveling the wilds together with her sister. Sisters - Jupiter and Junona.Brother - Janus. Through her mother Osprey she is related to many Redhawk caldera wolves, who were fathered by her uncle Peregrine Redhawk. She is also related to Indra and Laurel Redleaf, as well as to a number of DeMonte and Endore family wolves, though she has no knowledge of this, because her grandmother March Owl Redleaf had disowned her parents and the inherited family name early in her life. Email: Send Wraen an email. Current time: April 21, 2019, 07:03 PM Powered By MyBB, © 2002-2019 MyBB Group.